Rehearsals have started for a latest offering from Stan’s Cafe; “Finger, Trigger, Bullet, Gun”. Unusually for Stan, this is a commisssioned play, penned by Serbian writer, director and former MP. Nenad Prokic. “Finger, Trigger, Bullet, Gun” concerns itself with the political manœverings which led to the assassination of Franz Ferdinand in Sarajevo, 1914 – an action credited with igniting World War I. 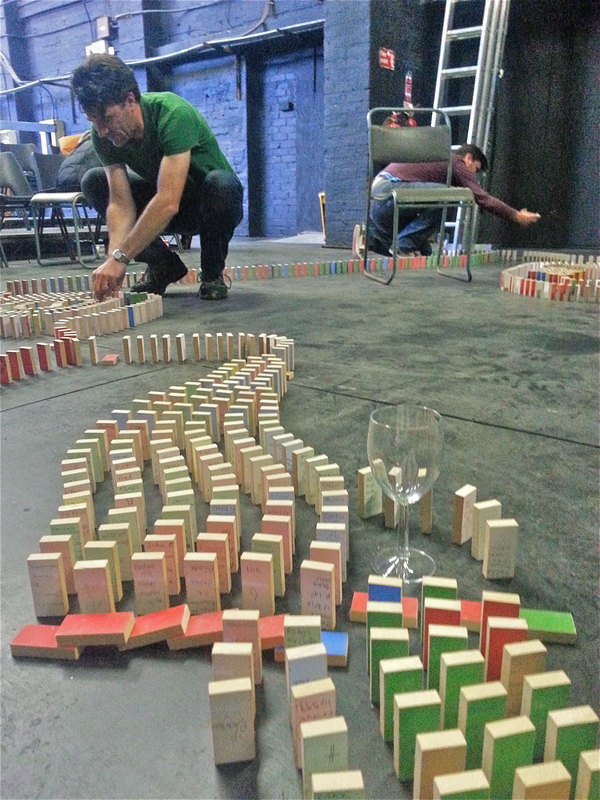 In image below director James and performer Jack Trow are seen constructing the set. As part of a parallel education project pupils at Washwood Heath School in Birmingham have contributed to the process by painting and dedicating 19,240 domino-sized monuments to each of the soldiers of the British Fourth Army killed on the first day of the Battle of the Somme, 1st July 1916.